In the Pamplona bull running, alongside the approximately 2,500 runners who participate in the event during the weekdays, and the almost 20,000 spectators watching from their balconies, behind the fences and in the bullring, there are some 650 people who neither run nor watch, but are there to do their job. 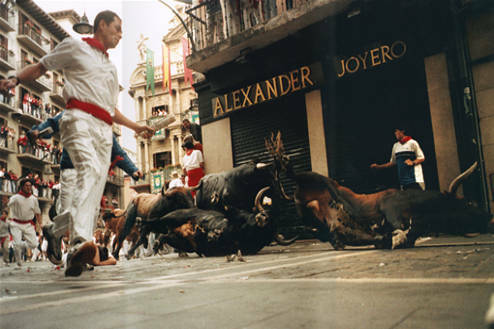 This considerable task force which is responsible for organising the bull run for these eight mornings in July, demonstrates the importance given to the event in Pamplona. Firstly, mention should be made of the presence of 150 municipal police from Pamplona, in addition to the Navarre police called the Forales. These policemen have a three-part mission in the bull running each morning: A). Before the run, they must clear the route of any non runners still present from the night before. B). Contain the runners between the two police barriers located at the beginning of the Santo Domingo slope and the start of the Mercaderes street. C). Enforce the bull-running prohibitions set out in the municipal and autonomous community regulations. In addition to the police, there are 200 members of the Red Cross and DYA, co-ordinated by SOS Navarre and responsible for attending to minor injuries in the street and for transferring any seriously injured people to hospital. These people are to be found at 15 points located along the route, and have 15 advanced care ambulances for transferring injured people. Furthermore, each morning, 19 doctors and nurses are ready in the two operating theatres at the bullring and, in the two public hospitals in Pamplona, four complete teams of surgeons await the hypothetical arrival of the wounded. The media is another important group of people working in the fiestas each morning. In total, there are 200 reporters pertaining to the press, radio, internet, TV, magazines and news agencies, in addition to photographers, reporters and TV technicians from more than 50 national and international media organisations, as accredited each year with the Pamplona city council. Finally, mention should be made of another group of workers - the carpenters who mount and dismount the fencing each morning, the street cleaners who sweep the streets prior to the run, and the ticket sellers and doormen at the bullring.